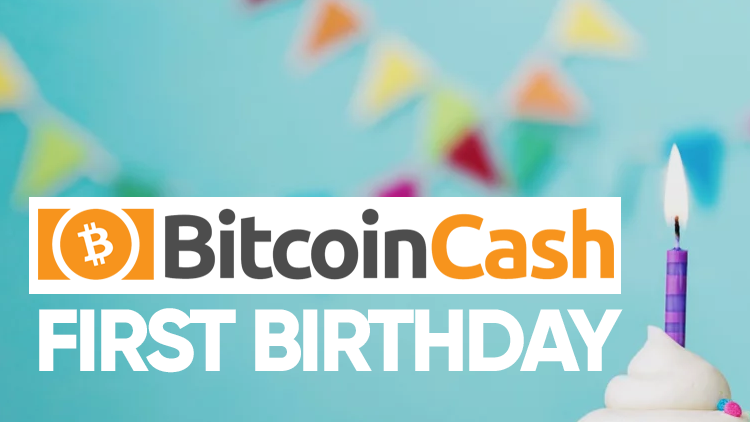 Last week marked the first anniversary of the Bitcoin hard fork which finally resolved the Bitcoin Scaling Debate after years of arguments, disputes and contentions. What resulted was a hard fork to the Bitcoin protocol which split Bitcoin into two separate cryptocurrencies – Bitcoin (BTC) and Bitcoin Cash (BCH). A hard fork is an update to the protocol of a cryptocurrency which requires all nodes or users to upgrade to the latest version of the protocol software. In simple terms, a hard fork is a permanent divergence from the previous version of a cryptocurrency’s blockchain. Hard forks change the underlying rules of the protocol by adding new features to the network’s functionalities, or by changing the core rules entirely. For readers new to Bitcoin, here’s a brief summary of the debate which led to last August’s hard fork: for years leading up to the fork, developers and heavyweights in the Bitcoin community debated the best process to scale Bitcoin for mass adoption. Because Bitcoin’s block size is limited to one megabyte every ten minutes, the Bitcoin network is only able to handle around seven transactions per second (compared to Visa’s 24,000). This restriction with its block size severely limits the functionality of Bitcoin as a fast and cheap payment network. As the popularity and use of Bitcoin grew, the increase in transactions led to network congestion, resulting in transactions being unable to be processed in the current block. This caused some transactions not to be confirmed for hours on end. In order to jump the transaction processing queue, a fee market was developed which allowed users to pay higher fees to process their transactions more quickly. This led to a rise in the cost of transactions and a fall in the user experience of Bitcoin. The once fast, cheap and efficient Bitcoin network was now swamped with transactions which created a slow, clunky and unreliable network. In brainstorming solutions to scale Bitcoin, the community was split into two ideologies of thought. One idea would be to simply increase the block size, which would allow more transactions to be processed within a ten minute block. And as more and more transactions were submitted to the Bitcoin network, the block size would be continuously increased to accommodate the growth in network traffic. The second idea posed by Bitcoin developers was to create another payment layer above Bitcoin, and then to use the Bitcoin Blockchain to verify transactions which occurred on this layer which is known as the lightning network. This separate payment layer would allow for transactions to be batched together and ‘netted out’ against other transactions in a lightning fast and extremely cheap way, and then eventually settled on the Bitcoin Blockchain. The debate on whether to scale Bitcoin off chain, or to increase the block size indefinitely is what is known as the Bitcoin Scaling Debate. In using the ‘congested highway’ analogy, one group offered the solution of adding extra lanes to the highway as required to meet the increasing traffic demand. The other group posed the idea of creating other methods of transportation, such as rail or air travel, which would run alongside the highway, with the commuters still being able to depart and arrive at their chosen destinations. After years of debate, the divergence in ideas saw the Bitcoin protocol split into two; Bitcoin and Bitcoin Cash. Without taking sides on the scaling ideologies of both BTC and BCH, there are some positives which resulted from the much feared hard fork. Bitcoin is an experiment in monetary science. It is attempting to create an immutable, censorship resistant method of value transfer which can scale en masse. In doing so, many different approaches to solve this problem should be welcomed. Many experts in the Bitcoin (BTC) camp tout that increasing the block size will lead to network insecurity. They also point out the unsustainability of continuously increasing the block size as demand on the networks grows. However, if the big block experiment is actually successful, then it can always be integrated into the Bitcoin protocol. So in a way, Bitcoin Cash, along with all other hard forks which have followed, are in essence test nets for ideas which may one day be implemented into Bitcoin. The Scaling Debate also helped to push Bitcoin in the direction of adopting Segregated Witness, an update to the code which solves the issue of transaction malleability, and makes off chain solutions like The Lightning Network possible. Holders of Bitcoin received an equal quantity of Bitcoin Cash as they held in Bitcoin, which meant that they could sit back and watch the development of both chains without the need to take sides. In any event, twelve months have flown by since Bitcoin’s contentious hard fork. Bitcoin continues to develop second layer solutions such as The Lightning Network, while Bitcoin Cash experiments with their 32 megabyte block size. And although both sides may think they are in competition, they’re actually experimenting with different approaches to solving the same problem of creating immutable, censorship resistant value transfer.